This is fall in a skillet. I’ve made it three times in as many weeks, and will probably make it again soon–it’s that good! 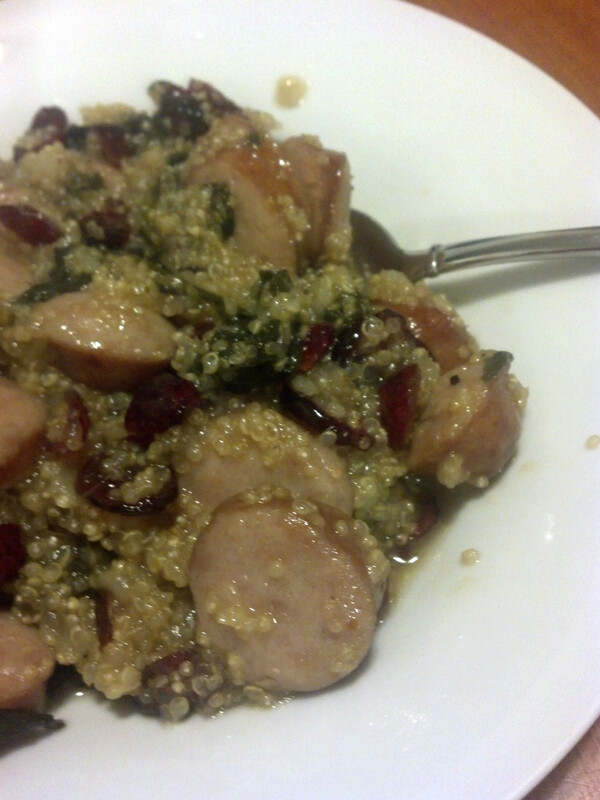 Sausage, spinach, cranberries, quinoa, all cooked in chicken broth and apple cider. Yes, apple cider. Intrigued? 1. Slice your sausage and dice your onion. Put olive oil in a large skillet or pot which has a well-fitting lid. Heat over medium high. 2. Add sausage and onion. Cook for 2-3 minutes. 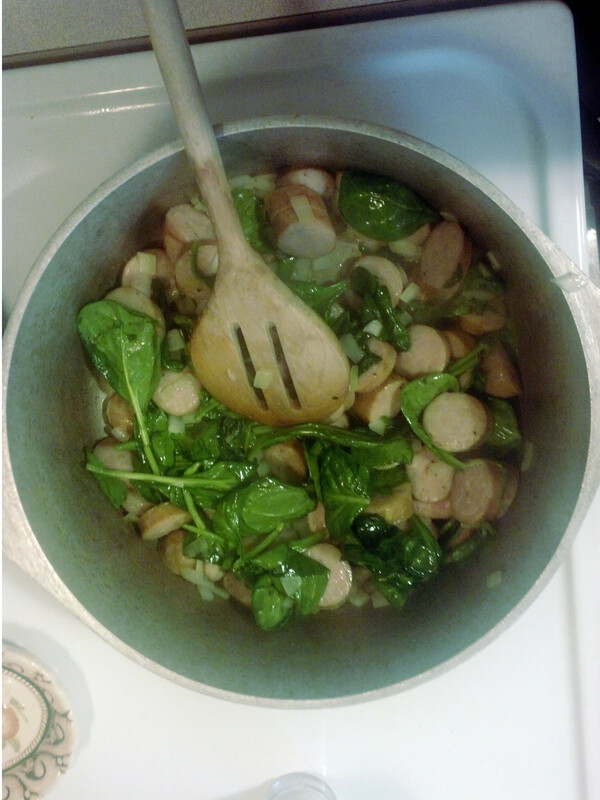 Add spinach. It will look like a lot at first, but then wilts after a couple minutes. Add salt and pepper. 3. 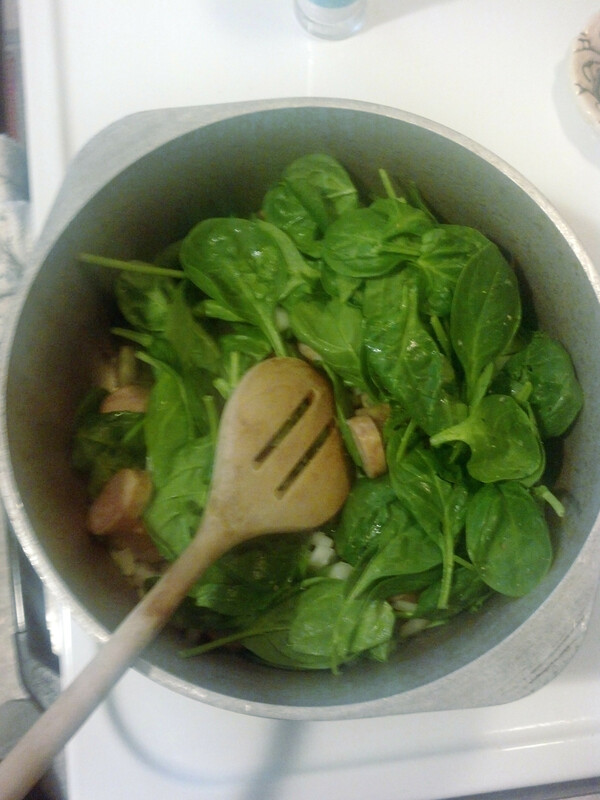 Once the spinach is fully wilted, add the cider and chicken broth, and increase the heat until it boils. Add quinoa, turn heat back to medium, and put the lid on it. Leave the lid on, and let it simmer for 25 minutes, or until all the liquid is absorbed. 4. Remove from heat, add cranberries, put the lid back on, and allow it to stand for 5 minutes. Can’t wait to try it… maybe Thurs’s supper?